Select Your Liner Size for Pool with 52" Side Wall: Required Choose Options 18' Round (52" Height) 21' Round (52" Height) 24' Round (52" Height) 27' Round (52" Height) 30' Round (52" Height) 12' x 24' Oval (52" Height) 15' x 24' Oval (52" Height) 15' x 30' Oval (52" Height) 16' x 24' Oval (52" Height) 16' x 32' Oval (52" Height) 18' x 33' Oval (52" Height) If you don't see your size please call for price and availability. Constructed of top-quality Standard or Heavy gauge vinyl, and packed with U.V. inhibitors, our liners will last for years and years. Standard gauge liners are backed by a 15-Year Warranty, while Heavy gauge liners are backed by a 25-Year Warranty. 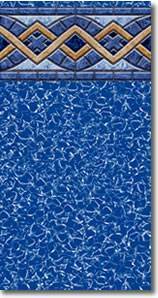 All beaded liners available to fit 48", 52” or 54" high flat bottom pools with a beaded coping attachment. Available in 5 vibrant patterns. *Our liners do not fit Wilkes® Pools or Gebralter® Pools.